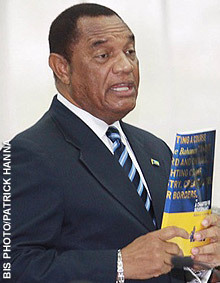 Both Recurrent Expenditure and Capital Expenditure were in line with budget projections at the mid-point of this 2012/2013 fiscal year, Prime Minister Perry Christie said. “The fiscal slippage this year has absolutely nothing to do with so-called ‘over-spending’ and everything to do with revenue performance related to emerging developments of the tax base,” Prime Minister Christie said. The Prime Minister was presenting his contribution to the 2012/2013 Mid-year Budget Statement in the House of Assembly March 18, 2013. He said at the mid-point of the fiscal year, the government had to address that fiscal slippage for the sake of maintaining and, to the greatest extent possible, bolstering confidence in The Bahamas as an attractive investment locale and strengthening prospects for economic growth. “In the statement, the government laid out a balanced strategy for tackling not only the near-term fiscal slippage but also, quite critically, the medium fiscal challenges that confront us,” Prime Minister Christie said. The Prime Minister said to secure the government’s 2012/13 objective for the GFS Deficit (ie 6.5 per cent of GDP), the government is holding Recurrent Expenditure to $1.72 billion, down $101 million from the budget estimate of $1.821 billion. As well, he said the government is keeping Capital Expenditure at a level of $363 million, down $37 million from the Budget forecast of $400 million. He explained the government’s plan features determined and sustained action in respect of Recurrent Expenditure over the next four fiscal years, designed to reduce it by four full percentage points of GDP by 2016/17, at a steady rate of one-half point per year. “Let us be clear on this matter: We will keep the growth of Recurrent Expenditure over the four years at a rate below the growth of the economy. We are not slashing spending and eliminating jobs as some nations around the world have been obliged to do,” Prime Minister Christie said. The Prime Minister said the government’s plan does include measures designed to enhance the yield of the government’s revenue system to a level more in line with that observed elsewhere in the region. The government’s approach in this regard is measured and balanced: it is targeting both improved revenue administration for existing taxes, as well as new sources of revenue. He explained that the proposed value added tax (VAT) is expected to make an important contribution to enhanced revenue collections as of the 2014/15 fiscal year and going forward. “The details of the VAT proposal along with the other proposed revenue reforms are laid out clearly in the White Paper that the government issued prior to the Mid-Year Statement. I need not repeat them here. The statement also included details and updates on the new Central Revenue Agency, reforms to the Real Property Tax system and the Customs Department, as well as the pending introduction of excise stamps on tobacco products to significantly reduce revenue leakage,” Prime Minister Christie said. During his contribution to the 2012/2013 Mid-year Budget Statement in the House of Assembly March 18, Prime Minister Perry Christie said that following through on his government's fiscal plan will create an environment conducive to stronger economic growth and job creation and "place the government in a sustainable fiscal position to be able to fully implement its ambitious policy agenda."